Rediff.com » Movies » Crowning of the new 'Raj'? Crowning of the new 'Raj'? Prithviraj has been anointed as the heir apparent of Malayalam filmdom for some time now. 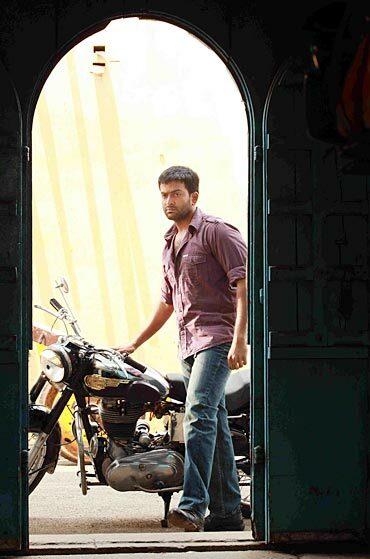 With both the big Ms (Mammootty and Mohanlal) on a roller coaster ride, Prithviraj has become the focus of attention. If the bumper initials for Anwar are any indication, the young hero has become the new Raj of the box office as well. B.Unnikrishnan's The Thriller, a murder mystery, will hit the theatres very soon. After completing the period drama Urumi, directed by Santosh Sivan, Prithviraj will act in City of God, directed by Lijo Jose Pellissery. Ranjith Sankar's Arjunan Saakshi will begin by mid-November. Prithviraj is also doing a cameo in Shafi's Makeup Man. With at least a dozen announced projects awaiting him and more in the pipeline, this youngster is truly rocking. Young actor Asif Ali will play the lead along with Nithya Menon in director Siby Malayil's forthcoming film, Violin. Asif started his career playing a techie with negative shades in Syamaprasad's Rithu. In Siby's earlier film Apoorvaragam, Asif again played a negative character, with Nishan. Asif will soon be seen in M A Nishad's laugh riot Best of Luck, with Kailash, Rima Kallingal and Archana Kavi. Mammootty has a cameo in the film. He is currently acting in Rajesh R Pillai's Traffic and Rajesh Kannamkara's Ithu Nammude Kadha. The industry buzz is that the young actor is one to watch out for. The pooja of Ivan Megharoopan, directed by P Balachandran, was held recently in Kochi. 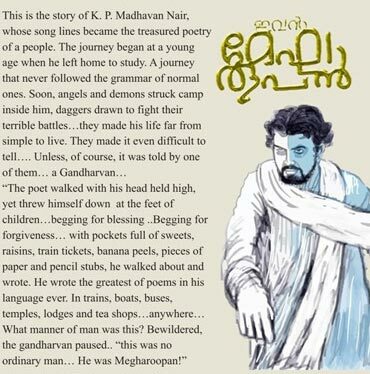 The film narrates the story of poet K P Madhavan Nair who lived an unconventional life and penned spectacular lines. The life of legendary poet P Kunhiraman Nair is believed to be an inspiration for the film. Prakash Bare, who played the lead in Sufi Paranja Katha, is playing the role of Madhavan Nair on screen. He is also the producer of the film, under the banner of Silicon Media. Rajiv Ravi is the cinematographer and Sharreth is the music director.